For research purpose I visited Coach again to see for myself the quality and to check out price point. See what I do for this blog. ~smile! Anyway, upon closer inspecting, I must say I don't like the metallic bag as much anymore. The price is in the high $700, I think $768 or something close. The material is leather but the treatment makes the surface look slightly scaly, which is not my cup of tea at all. And the bag is slightly on the heavy and large side which makes me wonder if the size will overwhelm my petite frame. However I do like the cognac and bright colt blue colors that are also available, in the mid-$800 range. I think I will need to look at Mulberry again and decide. With Coach, I don't like the design on the back of the bag. When I buy a bag, I like the outside to be clean, free from zippers and small pockets everywhere, unless these details makes the design cool like a Balenciaga. I say look at Mulberry again. I'm tired of Coach! :) I'm not a fan of the metallics lately either. They have to be done right. I don't really like the metallic of the bag either, but great review! Definitely far too expensive for a bag. I love the style though, but not the colour. 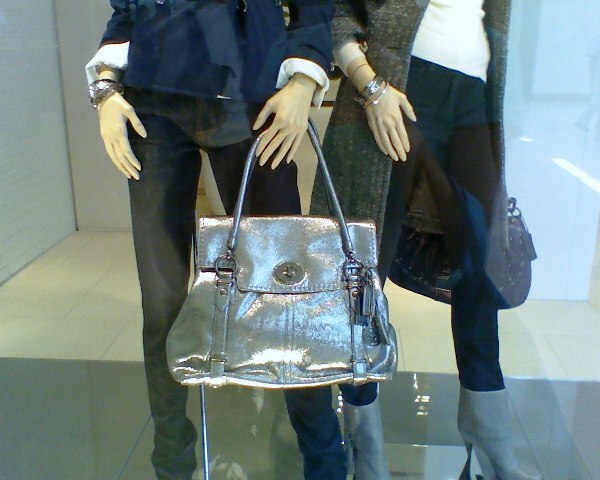 The style of the coach bag looks cute but I don't like metallic bags. It's too shimmery. I like big handbags, like messenger bags, since I always have a ton of things to carry when I go out. i hope you end up buying the bag that you really like! Good idea, going back to check. That's a smart decision, especially for something so pricey. It's amazing how an item looks gorgeous and fabulous one day and then after some consideration, doesn't seem that cool after all. I think you'll make the right choice! Ah to own a Balenciaga! i am definitely loving the boxy bags that are in for fall! Oh, goodluck choosing a bag! This one is a little too shiny perhaps? Metallic may not be too versatile. Goodness, big investment, I applaud you for taking a very measured and careful approach! I am going crazy over anything cognac this season. Maybe I should visit the region of Cognac here in France... he hee! Coffee, caramel, cognac... bags, belts, boots... I'm getting fashion tipsy! WOW, super expensive! I'm not crazy about metallic, so I guess that's a no for me.